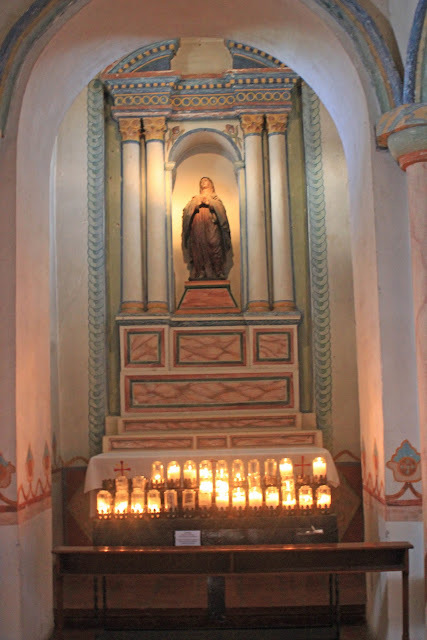 On our way back to Murrieta from Mission San Diego de Alcala, we headed up the coast to Oceanside to see our second Mission of the day: San Luis Rey de Francia. 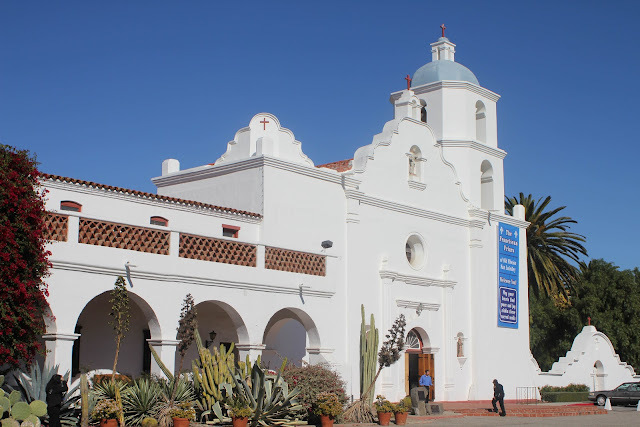 San Luis Rey was the largest and most populous of the California missions in its heyday, with thousands of head of cattle and sheep, olive groves, orchards, and vineyards. It was named in honor of King Louis IX of France, hence the nickname "King of Missions." 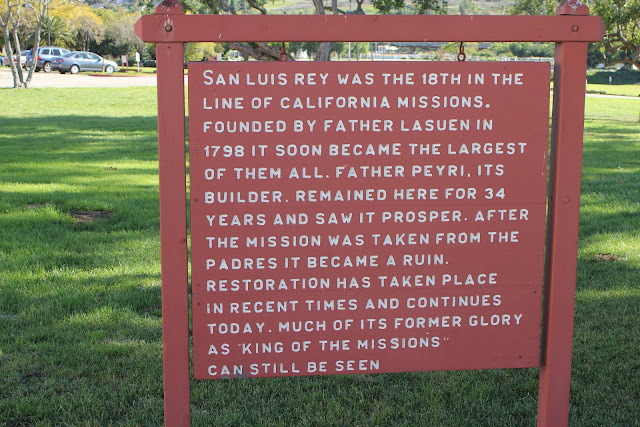 San Luis Rey was founded on June 13, 1798 by Father Fermin Lasuen and was the eighteenth in the series of 21 missions built by the padres in Alta California. When we visited yesterday, the museum, visitor center and offices were all closed to allow staff to attend a funeral mass for a Brother Kelly Cullen. In fact, services had just finished when we arrived, so we spent most of our time just walking around the grounds (although the church was open, so we were able to go in and see that). 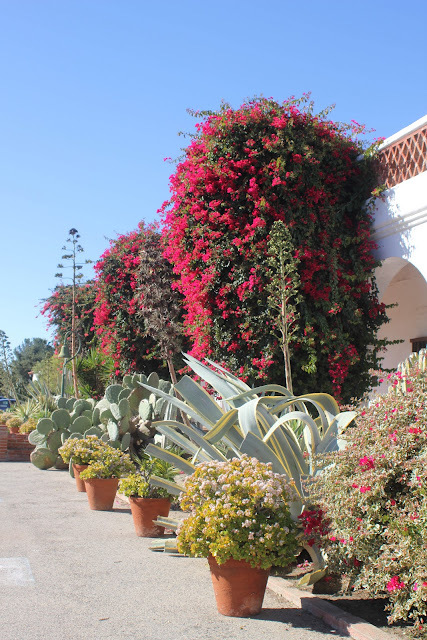 Bougainvillea, cacti, succulents and agaves at the entry. Red Fairyduster (Calliandra californica?) growing in a planter bed. 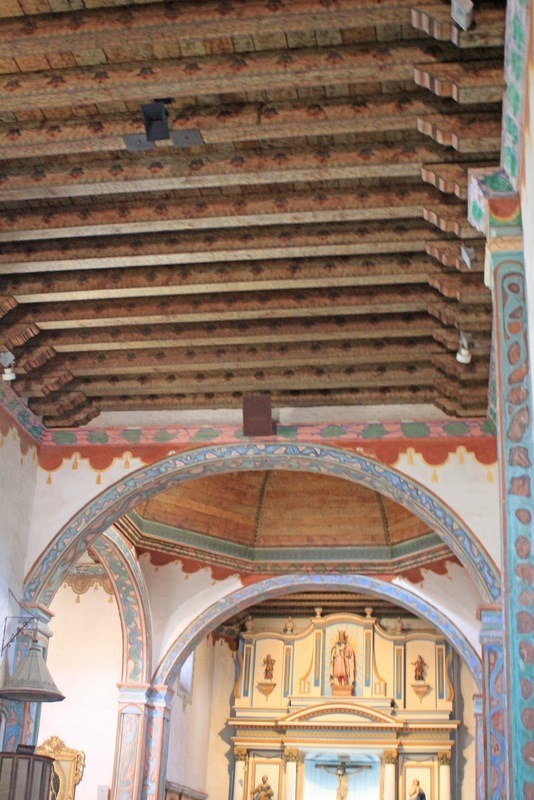 San Luis Rey was abandoned in the 1830s and fell into ruin after the Mexican government secularized all the California missions. 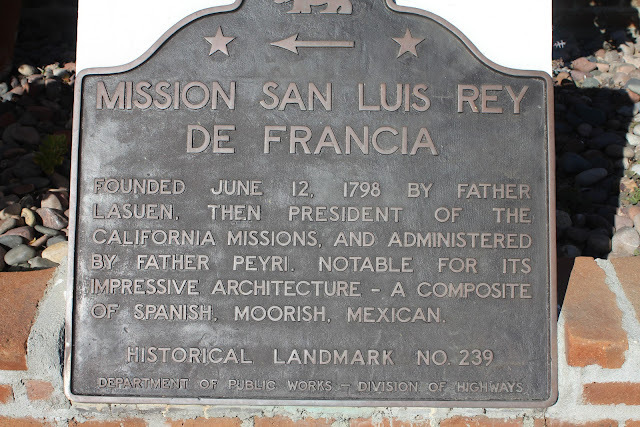 After secularization, Governor Pio Pico ended up selling some of the missions, including San Luis Rey in 1846, to his relatives for a fraction of their value (nice to be related to the Governor). President Abraham Lincoln returned the missions to the Catholic Church in 1865, but San Luis Rey remained unoccupied until 1892 when restoration efforts were initiated. The current church, the 3rd one in this location, was built in 1811. Today, it is a working mission and is home to a community of Franciscan Friars. Canary Island Date Palm (Phoenix canariensis)? next to the bell tower. Cemetery. 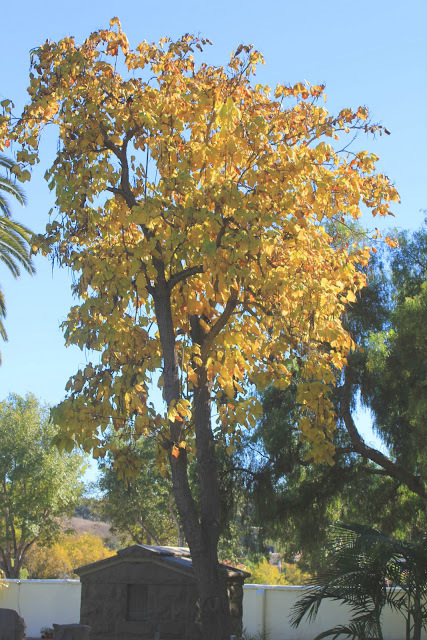 Gorgeous fall foliage on a Western Catalpa (Catalpa speciosa). Cemetery. 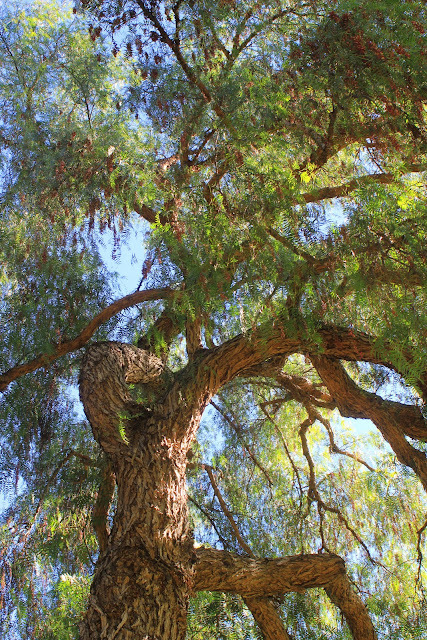 One ginormous California Pepper Tree (Schinus molle). The first California Pepper Tree (i.e., Peruvian Pepper Tree), was planted at San Luis Rey in 1830. We were not able to see this historic tree yesterday as the gate to that part of the grounds was locked (perhaps due to the funeral service). The one taken in this photo was growing in the cemetery. 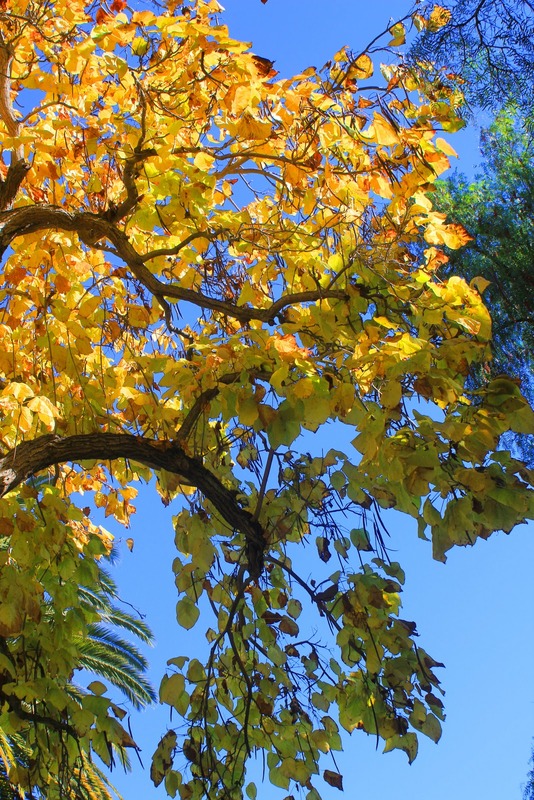 Today, these trees can literally be found growing EVERYWHERE in cultivated and other landscapes throughout California. 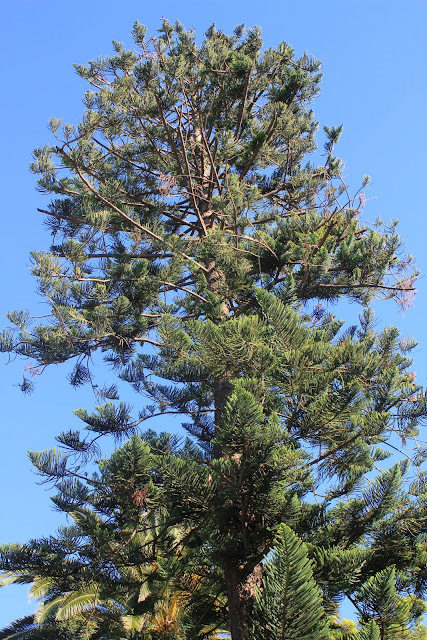 They are considered invasive and can displace native trees, so they are not exactly a fav of mine. However, the gnarled and towering grandeur of the really old specimens is still something to behold. Norfolk Island Pine (Araucaria heterophylla). Cemetery. Hours: Gift shop open 10am-5pm daily (except major holidays); Museum open daily (except major holidays) M-F 9:30am-5pm, Sat-Sun 10am-5pm. San Luis Rey is the 18th of 21 California Missions. Prominent Missionary Leaders: Father Peyri, who led the mission for 36 years. Father Peyri was not only an energetic leader with a genial disposition, he was a talented architect and builder. When the beloved padre was forced to leave after the Mexican takeover of California, hundreds of neophytes followed him to San Diego, begging him to return. Indians Joining this Mission: The Takic speaking people associated with Mission San Luis Rey have been called Luiseno since the Spanish occupation. The native term for these poeple is the Payomkowishum. The descendants of the neophytes at the mission's asistencia, San Antonio de Pala, now call themselves the Pala Band of Mission Indians. Mission Site: Located on a hill overlooking a peaceful valley at the native village of Tacayme in the region known as Quechia, about five miles east of present day Oceanside. Layout: San Luis Rey extended over 6 acres. By 1826 the quadrangle measured 500 feet on each side. There was a long corridor with 32 Roman arches in front of the patio. 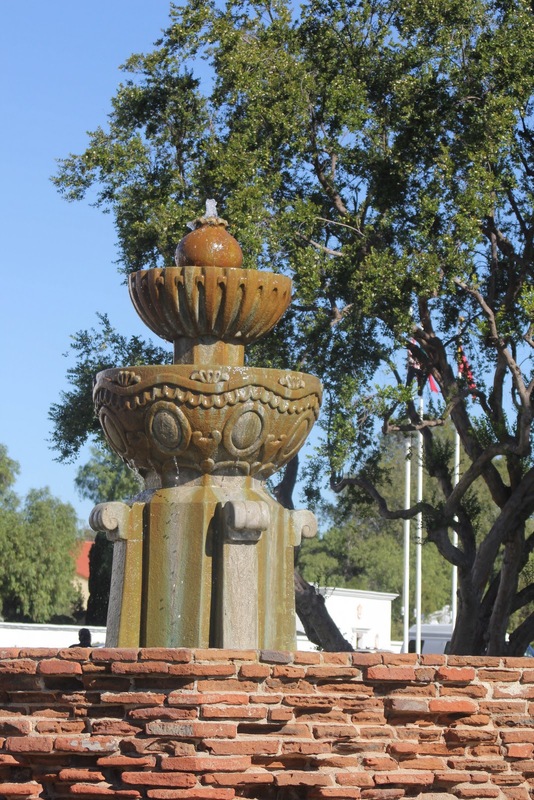 Water Source: The nearby San Luis Rey River and two springs fed an aqueduct or zania that supplied water through two fountains and a charcoal filtration system before irrigating fields. Population: Although San Luis Rey was one of the last missions founded, it rapidly became the most prosperous of the California missions, with a population that reached 2,869 in 1825, over 3 times the mission average. Livestock: San Luis Rey rapidly built its livestock herd from 800 in 1798 to over 20,000 within a decade. In 1832 the total number of animals peaked at 57,380, including 27,500 cattle and 26,100 sheep, dwarfing all other mission herds in size. 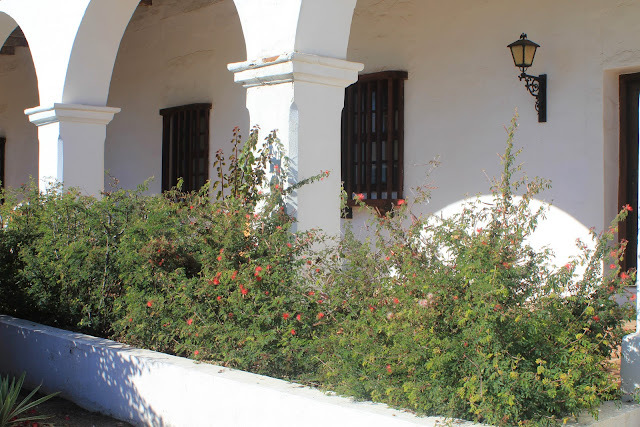 Agricultural Output: San Luis Rey harvested over 411,000 bushels of grain and produce during the period 1789-1832. Wheat, barley, corn and beans were the primary early crops. 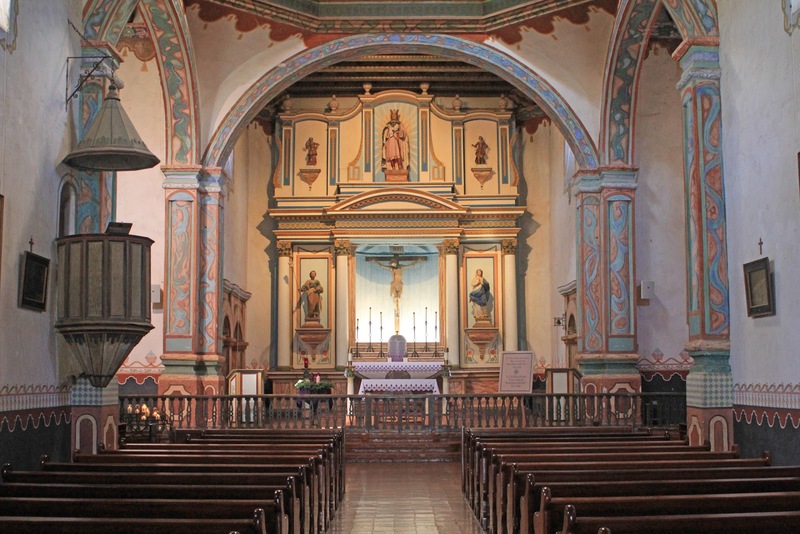 Mission Church: The San Luis Rey Church, completed in 1815, is the only surviving mission church laid out in a cruciform plan. 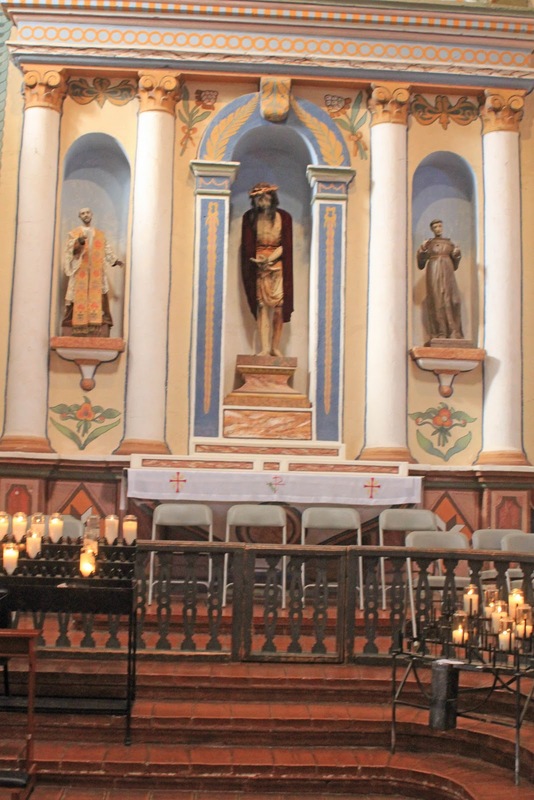 It is 165.5 feet in length and the nave spans 27.5 feet in width by 30 feet in height. A cupola - unique among the California missions - is an octagonal lantern formed of 144 panes of glass. It tops the wooden dome built over the sanctuary in 1829. Mission Bells: Four bells hang in a three-story domed bell tower. The mission was designed with only one bell tower. 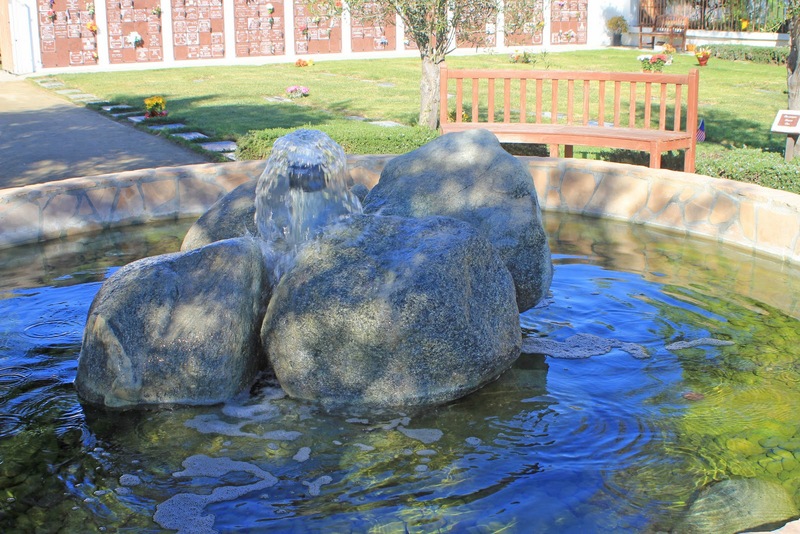 Mission Art: Look for the original hand hammered baptismal font in the baptistery, along with religious iconography and mission era art and artifacts exhibited in a beautiful interpretive museum. Special Attraction: The sunken garden and lavanderia (laundry), located in a hollow to the south of the mission may be reached by descending 46 fire tiled steps. Two springs provided water that sprouted from the mouths of sculpted gargoyles into the lavanderia. Significant Event: Departure of Father Peyri. 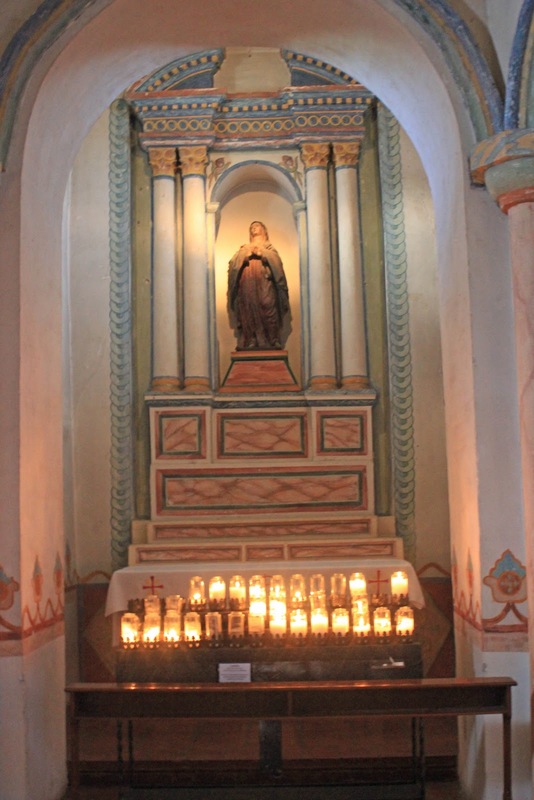 Current Status: A consecrated Roman Catholic church attached to the Franciscan community of San Luis Rey de Francia. 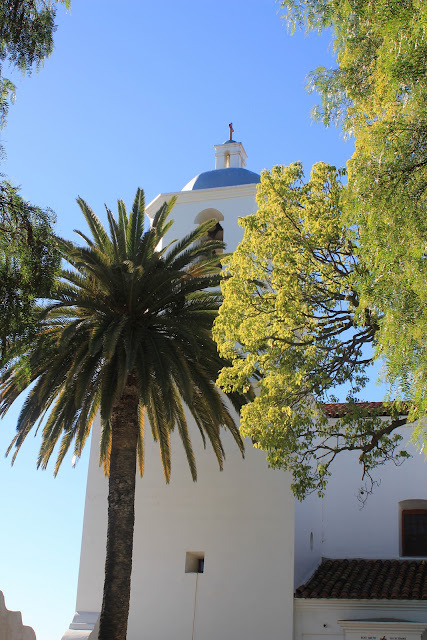 Interesting Facts: In 1816, the asistencia or sub-mission of San Antonio de Pala was established at a mission rancho around 25 miles east of the main complex. This is the only one of a score of mission-era asistencia that is intact and continues to serve its descendant Indian community. The asistencia is located on the Pala Indian Reservation. Two Indian boys, Pablo Tac and Agripito Amamix, were brought to Rome by Fr. Peyri to further their education and training for the priesthood. 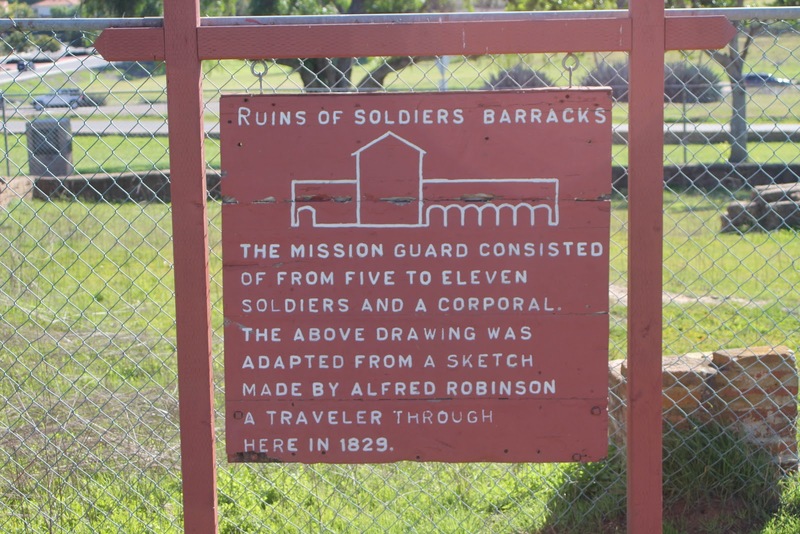 A document from the mission's cornerstone identifies master carpenter Jose Antonio Ramirez as the "architect and director" who completed the mission church in 1815. 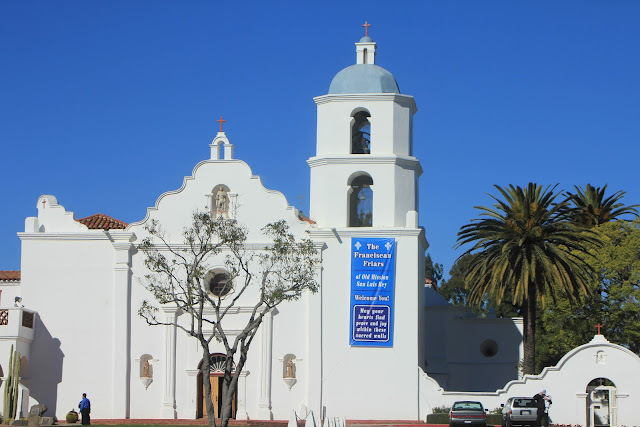 A Franciscan novitiate was established on site in 1893 and alter developed into San Luis Rey College. Today it is a retreat and conference center. 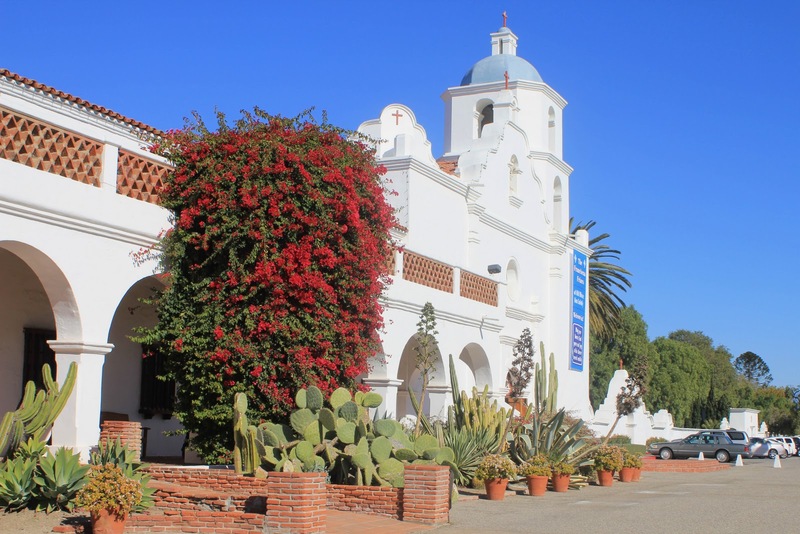 The mission was the site for several episodes of the Walt Disney T.V series Zorro in the 1950s.